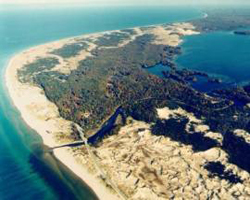 Ludington State Park is comprised of nearly 5,300 acres of scenic sand dunes, shoreline vistas, ponds, marshlands and forests. It is situated between Hamlin Lake and Lake Michigan with several miles of shoreline and beaches on both bodies of water. The park is Michigan’s premier camping destination offering 352 sites and 3 mini cabins with electric and modern restrooms. There are also 8 non-electric tent sites and 10 rustic hike-in backpack sites with access to the restroom showers. Sites fill quickly so reservations are recommended and may be made up to 6 months in advance for dates between Memorial Day and Labor Day.